In the past two weeks Lewes have dropped 3 points in injury time against teams in the top 3. After the heartbreak of a home draw against Lowestoft Town came the sickening blow of a 93rd minute winner for league leaders Billericay Town last Saturday. However, it is a mark as to how far the team has come that we look back at these results with frustration rather than embarrassment. Last week in Essex, Billericay showed that the teachings of the likes of Charles Hughes (former performance director of the FA who preached the direct long ball game) and ex-Cambridge United manager John Beck are still alive. Not only did Lewes come away with zero points, but two players with facial injuries one of which was serious enough to require hospital treatment. Win at all costs? Certainly not a motto I’d like my team to follow. The dropped points had been a blow in the fight for a play off spot. But redemption comes quickly in a tight season and so the visit of 6th place Hendon would give Lewes a great chance to “bounce back” as Mr A Partridge is so fond of saying. Hendon had been a surprise package this season. Not tipped amongst the favourites back in the pre-season, they started off like a train and topped the table in September when Lewes visited Vale Farm. Since then they unsurprisingly fell away, but recent form and the taking of a few big scalps has seen them jump back into the play off spots. Could they compete in the Blue Square Bet South? Well, many people thought exactly the same of Tonbridge Angels this time last year and they seem to be holding their own in the higher league, whilst the likes of Braintree Town and Hayes & Yeading were surviving against all the odds in the Blue Square Bet Premier on crowds of less than 400. This game marked the closure of the Non League transfer window so the days in the run up to the game had seen some frenzied activity by Lewes boss Simon Wormull. Well, actually, it had seen one player exit and nobody come in. 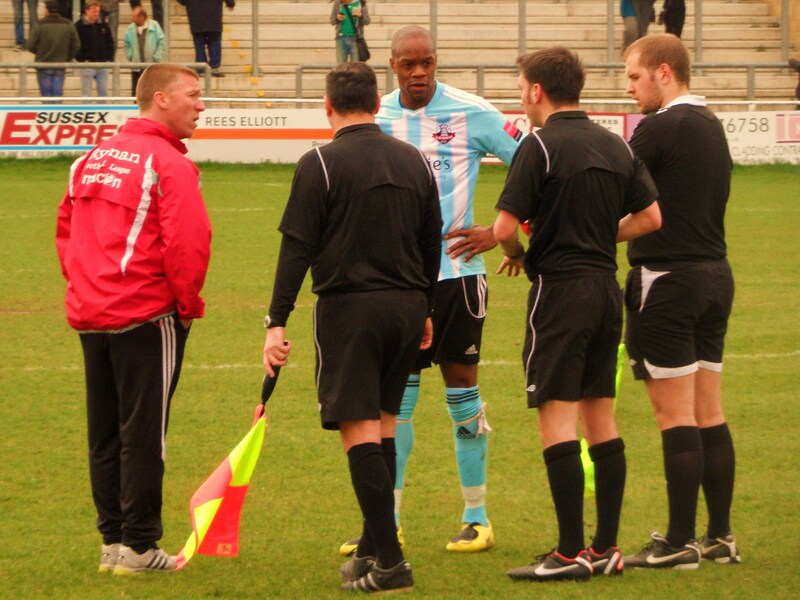 With a few injuries picked up recent weeks I offered my services to the club – my price? Just two pints of Harvey’s Armada and a Steak and ale pie. Cheap at half the price. I had hoped to announce the signing on Sunday morning as an April Fools joke but that was pushing the boundaries of reality a bit far. 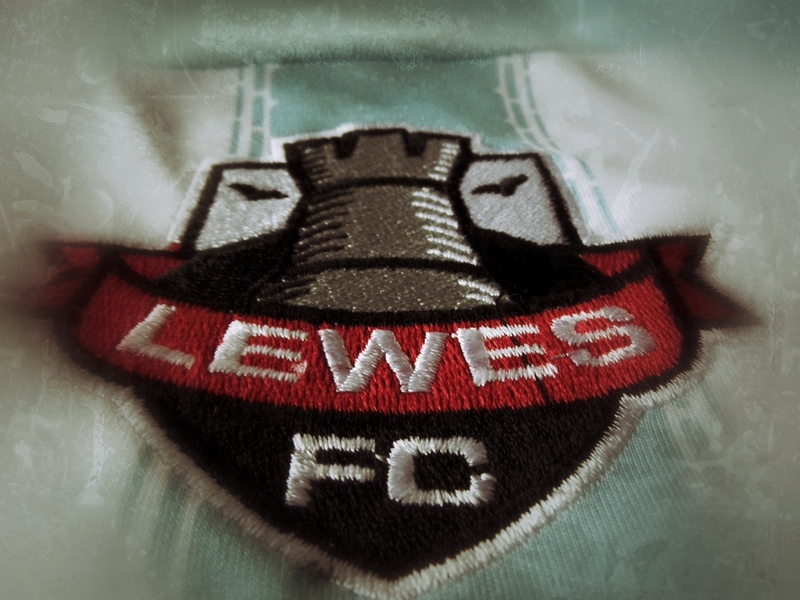 For the past few seasons Lewes have given their shirt sponsorship away to charities. 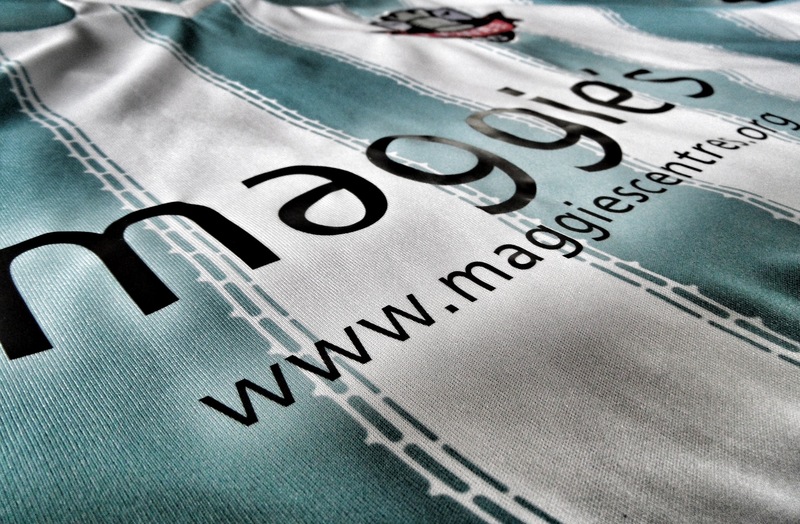 Last season it was the NSPCC and a local hospital, whilst this year it has been Samuels Childrens Charity on the home shirt, whilst the away one has donated to Maggies, an organisation who provide care, assistance and advice for cancer sufferers and their family. This game had been designated the “Maggies game”, where the club would promote their cause and try to raise some much needed cash for them. Recent events on a national scale had made many people associated with the game realise there are more important things than football and today was Lewes FC’s way of remind people of that. 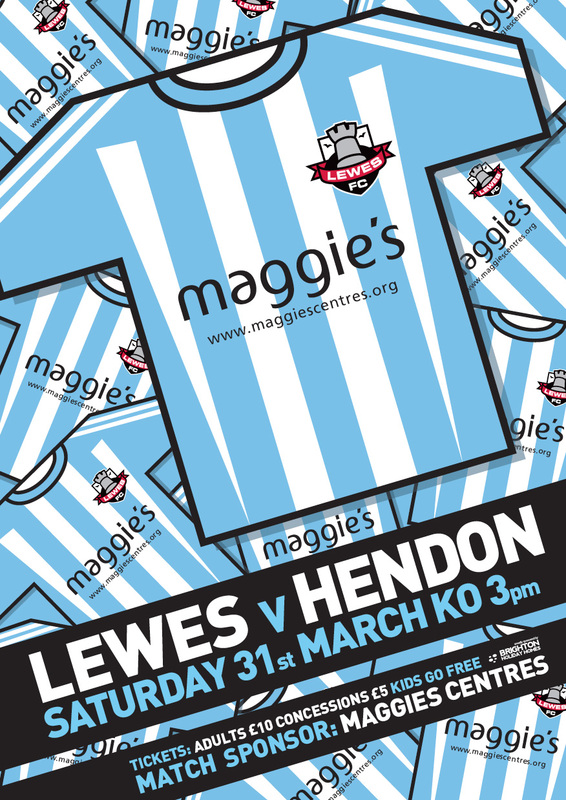 Lewes 3 Hendon 2 – The Dripping Pan – Saturday 31st March 2012 I do not think I can remember a better four minute spell of all out attacking football than I witnessed from the 47th to the 51st minute in this game. Lewes went in at the break 1-0 down but angry. Angry that a perfectly good goal had been ruled out by sheer incompetence of the officials. The response was a devastating burst of football that saw three goals in that four-minute period. But still there was time for a nervous four minutes of injury time. It is fair to say that the highlight of the first twenty minutes from a Lewes point of view was the arrival of Lolly with the Rook Pies (Please note: No rook was harmed in their production). It was disjointed, passes were going astray and Hendon had already hit the bar when a defensive mix up saw them take the lead when Belal Aite-Ouakrim got to a ball before Matt Ingram and it rolled slowly into an unguarded net. 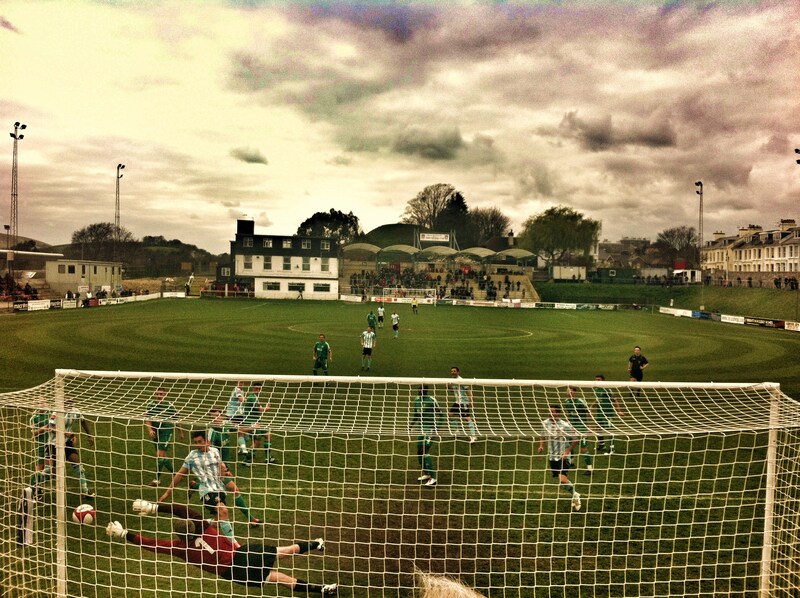 Gregory missed a sitter for Lewes, firing straight at local hero (and returnee for 2012/13?) Rikki Banks who is now on loan with the North Londoners when it would have been easier to score, and then Paul Booth nearly got on the end of a Crabb cross. But the main talking point came on the 40th minute. A Harding free kick was put into the box, Breach headed it goal-wards and Banks could only get a fingertip to the ball as it hit the back of the net. The referee immediately signalled a goal but then the linesman raised his flag. Now as you can see from the picture above, Gregory appears to be in an “active” offside position in front of the keeper. He didn’t touch the ball. Breach, the “scorer” is four players back (blonde hair, stooping down). The linesman told the referee (first hand information here) that the player in an offside position was “the scorer”…So Breach was offside when there was at least four players between him and the goal. As you can imagine when the half time whistle sounded the officials judgement on this was seriously questioned. Under Simon Wormull, our “technical respect” scores have been very good (in a low way) but recently we have been officiated by idiots. The presence of an assessor in the board room at half time gave me the opportunity to show him my photographic evidence. If you were still at the bar, or dare I say it, watching the TV in the Rook Inn as the second half started then you probably missed not one, maybe two, potentially three goals. The team talk by Worms must have been one up there with Al Pacino in Any Given Sunday as within 60 seconds Breach had forced a fantastic save from Banks. A minute later the keeper wasn’t so fortunate as Breach rose again and powered the ball home. Lewes had missed Breach in his hiatus down the A27 at Bognor Regis and whilst he was playing out of position in midfield, his presence at set pieces proved how he had been missed. Sixty seconds later Lewes took the lead. Another ball into the area, the ball pinballed around and Nathan Crabb prodded home. Seventy seconds later and Paul Booth rolled back the years to put Lewes three one up. We were on fire. Booth had a chance a few minutes later to score a fourth but Banks, who by this time had stopped playing along with the chants of the crowd, made a great save. This was the best spell of play I had ever seen Lewes play. We all felt the same. Cynical Dave was so excited he cracked open the emergency Humus and pitta. Yes, you read that right. Last year he kept an emergency pint in his inside pocket. Today, on his health drive it has been replaced by wholemeal pitta and tasteless mediterranean dips. With the clock ticking down and us leading by “the most dangerous score line in football” (according to David Pleat) I turned to a beaming Patrick Marber. “Three points in the bag, unless he puts up 4 minutes to add on”…and sure enough 4 minutes went up. At this stage I would have rather put money on Carlton Cole being top scorer in Euro2012 than Lewes holding on for a win based on recent form. And sure enough with a minute gone in added time, Hendon scored, although Scott Cousins shot was pretty unstoppable. Just three minutes to hang on for… ….and breath. Three points over a play off rival, a beer, a pie and all in the name of a great cause.